Stage 16 returns to the mountains after the second rest day. As always in the third week, a rider’s degree of freshness and desire will be put to the test. The day begins with 140 kilometers in the Aude and Ariège on difficult roads. Then there are three passes — the Portet-d’Aspet, Menté, and Portillon — before the final twisting, complicated descent into Bagnères-de-Luchon. The stage could very well see a breakaway going the distance, with a secondary battle on the descent of the Portillon between the general classification leaders. Riding alone over the top of the Col du Portillon, Adam Yates was on his way to winning his first Tour de France stage Tuesday into Bagnères-de-Luchon. Then on a right-hand switchback, just a few kilometers from stage 16’s finish, his dreams came crashing down with a slip of wheels. Quick-Step’s Julian Alaphilippe whizzed by Mitchelton-Scott’s British leader and took his second victory of the race, increasing his lead in the king of the mountains classification as well. Yates picked himself up after the crash and rolled home to third behind Gorka Izagirre (Bahrain-Merida). Overall, it was a tranquil day in the group of GC favorites. Geraint Thomas kept his overall lead, still 1:39 ahead of Sky teammate Chris Froome. Tom Dumoulin (Dumoulin) is 1:50 behind after 218 kilometers of racing into the Pyrenees. The race wasn’t void of drama though. Early in the day, a protest by farmers led to a race stoppage and tear gas from the protest affected a number of riders, including Froome. They rolled on after the disruption was cleared up and, as has been the case for many stages this Tour, Alaphilippe was animating off the front. In the breakaway, he kept racking up points. For awhile, he had help from teammate Philippe Gilbert. Gilbert led over the top of the Col de Portet d’Aspet, the day’s third categorized climb. However, the Belgian crashed over a rock barrier into a ravine on the descent. He picked himself up and was able to carry on, however, he soon dropped back to the peloton, leaving Alaphilippe to his own devices. Over the top of the day’s next climb, Col de Menté, Alaphilippe displayed his descending prowess putting the other breakaway riders under pressure. However, it all came back together in the valley before the Portillon, as the Tour made its only foray onto foreign soil in Spain. Yates attacked the six-man breakaway after a trio of riders, Bauke Mollema (Trek-Segafredo), Robert Gesink (LottoNL-Jumbo), and Domenico Pozzovivo were caught, five kilometers from the summit. Yates built his lead on the steady upper slopes and dove into the shady, narrow descent alone, just 10 kilometers from the finish. However, he wouldn’t be able to salvage his disappointing Tour with a stage win. His wheels slipped out on a hairpin turn and he crashed. Alaphilippe had attacked behind and soon passed Yates. The fight was over and the Frenchman rolled home to another victory. The GC favorites didn’t try any attacks on the final climb. 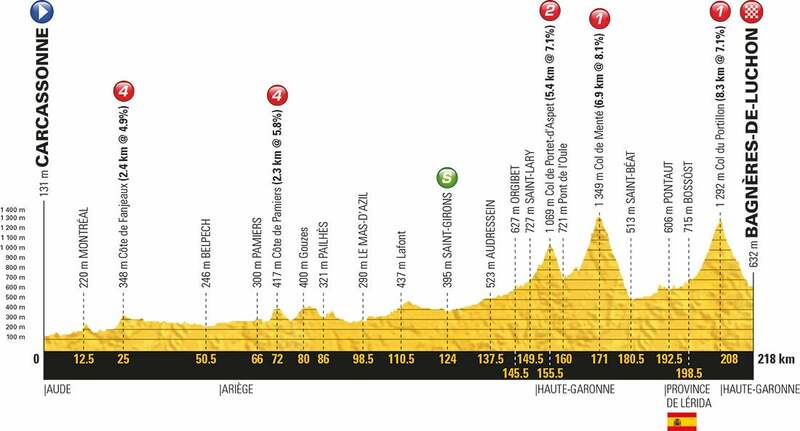 It’s likely they’re anticipating Wednesday’s stage 17, which is expected to decide the race. Incredibly short at just 65 kilometers, the run from Bagnères-de-Luchon to Saint-Lary-Soulan has three categorized climbs and an hors categorie finish. Col du Portet is a new climb for the Tour and at 16 kilometers averaging 8.7 percent, it should be a brutal finish to the stage.